Sorry for the over-exposed shot. We snapped this at night in a parking lot, with a lot of glare in the background. 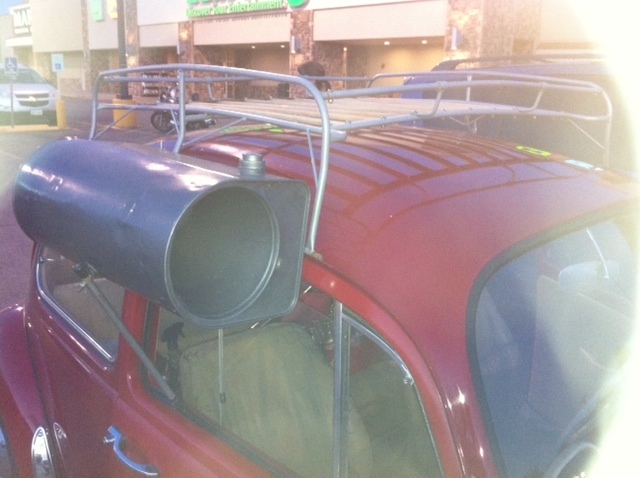 Tonight as Kit and I arrived at the parking lot of Hastings bookstore, we found ourselves beside a Volkswagen Beetle with an unusual-looking drum attached to the vehicle outside the passenger-side window. It was connected to a luggage rack that was itself rather different-looking. But the cylinder itself was the most striking object. Just as we noticed it, the owner of the vehicle, a young guy with shoulder-length hair, walked up. We asked what we were looking at, and he told us it is a cooler for the car. It’s a device that works on the same principle as the old “evaporative” coolers – sometimes called “swamp coolers” – that were common in homes before modern air conditioning became the norm. The cylinder scoops air as the car goes down the road. The air is channeled through a passageway that is dampened by the water. The water cools the air before it hits the interior of the car. The car’s owner told us that the thing really works. There is a screw-on cap on top of the drum, and when it is removed one can pour in water. And even ice as well, if one wants to make things especially refreshing. Anyway, neat idea. I’d like to see more of this sort of thing – simple, functional, practical solutions that don’t involve a whole lot of expensive maintenance and even more expensive repairs. Plus it’s so unconventional. And so funky-chic, not to mention hippie-retro, IF, that is, hippies ever dreamed up something like this. If they didn’t, they shoulda!